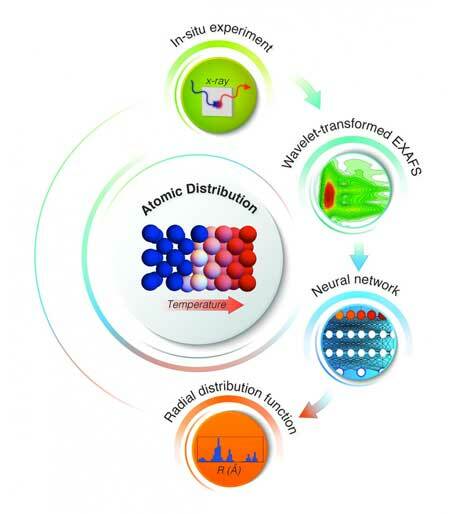 (Nanowerk News) If you want to understand how a material changes from one atomic-level configuration to another, it's not enough to capture snapshots of before-and-after structures. It'd be better to track details of the transition as it happens. Same goes for studying catalysts, materials that speed up chemical reactions by bringing key ingredients together; the crucial action is often triggered by subtle atomic-scale shifts at intermediate stages. "To understand the structure of these transitional states, we need tools to both measure and identify what happens during the transition," said Anatoly Frenkel, a physicist with a joint appointment at the U.S. Department of Energy's Brookhaven National Laboratory and Stony Brook University. Frenkel and his collaborators have now developed such a "phase-recognition" tool--or more precisely, a way to extract "hidden" signatures of an unknown structure from measurements made by existing tools. In a paper just published in Physical Review Letters ("Neural Network Approach for Characterizing Structural Transformations by X-Ray Absorption Fine Structure Spectroscopy"), they describe how they trained a neural network to recognize features in a material's x-ray absorption spectrum that are sensitive to the arrangement of atoms at a very fine scale. The method helped reveal details of the atomic-scale rearrangements iron undergoes during an important but poorly understood phase change. "This network training is similar to how machine learning is used in facial-recognition technology," Frenkel explained. In that technology, computers analyze thousands of images of faces and learn to recognize key features, or descriptors, and the differences that tell individuals apart. "There is a correlation between some features of the data," Frenkel explained. "In the language of our x-ray data, the correlations exist between the intensity of different regions of the spectra that also have direct relevance to the underlying structure and the corresponding phase." To get the neural network ready for "phase recognition"--that is, to be able to recognize the key spectral features--the scientists needed a training set of images. Janis Timoshenko, a postdoctoral fellow working with Frenkel at Stony Brook and lead author on the paper, tackled that challenge. First, he used molecular dynamic simulations to create 3000 realistic structure models corresponding to different phases of iron and different degrees of disorder. "In these models, we wanted to account for the dynamic effects, so we define the forces that act between different atoms and we allow the atoms to move around as influenced by these forces," Timoshenko said. Then, using well-established approaches, he used mathematical calculations to derive the x-ray absorption spectra that would be obtained from each of these 3000 structures. "It's not a problem to simulate a spectrum," Timoshenko said, "it's a problem to understand them in the backwards direction--start with the spectrum to get to the structure--which is why we need the neural network!" After using Timoshenko's modeled spectral data to train the network, the scientists put their method to the test using real spectral data collected as iron underwent the phase transition. "There are not a lot of experimental methods to monitor this transition, which happens at quite high temperatures," Timoshenko said. "But our collaborators-- Alexei Kuzmin, Juris Purans, Arturs Cintins, and Andris Anspoks from the Institute of Solid State Physics of the University of Latvia, my former institution--performed this really nice experiment at the ELETTRA synchrotron in Italy to collect x-ray absorption data on this phase transition for the first time." The neural network was able to extract the relevant structural information from the x-ray absorption spectrum of iron--in particular, the radial distribution function, which is a measure of the separations between atoms and how likely the various separations are. This function, unique for any material, is the key that can unlock the hidden details of the structure, according to Frenkel. It allowed scientists to quantify changes in the density and coordination of iron atoms in the process of their transition from one atomic arrangement to another. In addition to being useful for studying the dynamics of phase changes, this method could be used to monitor the arrangements of nanoparticles in catalysts and other materials, the scientists say. "We know that nanoparticles in catalytic materials change their structure in reaction conditions. It's really important to understand the transitional structure--why it changes, and how that affects catalytic properties and processes," Timoshenko said. Nanoparticles also often take on structures that lie somewhere between crystalline and amorphous, with structural variations between the surface and the bulk. This method should be able to tease apart those differences so scientists can assess their relevance for material performance. The method would also be useful for studying heterogeneous materials (which are made from a combination of particles with different sizes and shapes) and isomers of the same particle (which contain the same number of atoms but differ in their arrangements). "No technique can image positions of atoms in three dimensions with such precision to tell what's the difference between their shapes. But if we measure this radial distribution function, there is a chance to tell them apart--and address important questions about the role of heterogeneity in catalysis," Frenkel said.